We share this tutorial to take your DVDs from home and add them to your computer then put these DVDs to your Kindle Fire HD/Fire HDX and make it usable in FreeTime Unlimited. Question: How do I put downloaded DVD movies on to my Kindle Fire HD? If you want your Kindle to play the DVD movie files directly however you’ll have to convert DVD to .mp4 or you can download aVia Player from the Amazon App Store. It will play most any file. Then go to your Kindle Fire HD via your computer and create a “movies” folder so you could keep track of them easily. As for general advice, I would download ES File Manager so that you’ll have access to all your files without needing your computer every time. I would also install App Cache Cleaner and set it to “run at startup” and run every four hours or so, you’d be shocked how much that helps out in keeping your Kindle Fire HD running smoothly. 1. Add ES3 explorer to Kindle Fire HD. If you download from this website the ES3 file explorer will be in your Amazon Cloud on your Kindle Fire HD/Fire HDX. 2. Add camera/video program to Kindle Fire HD. This is .99 cents or your welcome to find any free camera but I am unfamiliar with others. The camera program will be in your Amazon Cloud on your Kindle Fire HD if you download from this link. 3. Add the Camera app to your FreeTime Unlimited if your doing this for your child. Go to manage content and subscriptions and then select all to find your camera app inside FreeTime Unlimited parental controls. 4. Download a DVD Ripper if you don’t have one. This link is for a Free DVD Ripper but takes a little more time then a paid version like Aimersoft DVD Ripper with no adware, spyware, or viruses that I like to use. I make no commission off of these they are just the programs I use. Get ready for the conversion? Just download the right version and follow the guide to rip and transfer DVD movies to Amazon Kindle Fire HD/Fire HDX with ease. How to Rip DVD to Amazon Kindle Fire series playable formats? Step 1. Open the DVD ripper and click on the upper “Load DVD” button to browse and import the DVD movies you want to convert. All added files will be listed on the left source area. You can preview the DVD videos on the right viewing window and take snapshots of your favorite movie scenes. Step 2. Set the destination folder to save the converted videos and choose the output format as MP4. Then you can click “Settings” to edit output parameters like resolution, frame rate, encoder, etc. as you like. Step 3. When everything is done, click the “Start” button to start converting DVDs to Kindle Fire MP4 videos. After the conversion finishes, you can get Amazon Kindle Fire supported MP4 videos in the output folder. All that is left to do now is to move the ripped DVD movies to the Kindle. Connect your Kindle via USB to your computer and drag & drop the movie to the Movie directory on the Kindle. Your finished! 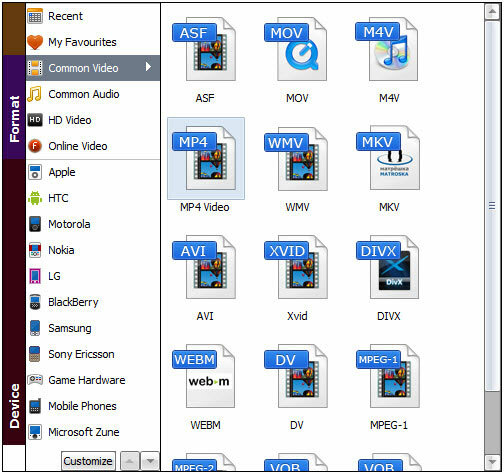 You can now view your DVD movies in the camera’s video section or in the ES3 file explorer. It will also pop up on your carousel for easy viewing after you open the video. I hope this was very helpful and please share with your FaceBook, Google +, Twitter friends and give my article a thumbs up to help people find this tutorial. If you have any problems leave a comment and I will get back with you with possible solutions. Just enjoy your DVD movies on Amazon Kindle Fire, Fire HD and Fire HDX! Additional Tips: How to HD Videos o Amazon Kindle tablets? Since the smart tablet is a nice video player how about playing H.265/HEVC, Tivo, MPG, MKV, FLV, AVI, VOB, M2TS, TS, M4V, etc. videos on Kindle? If Amazon’s Kindle (Fire HD, Fire HDX) doesn’t like these video files natively, how to fix the issue? Actually, most of the time we can enjoy MP4, MKV, WMV, etc videos on Kindle beautifully as it can support playing HD video content in a wide range of multimedia formats(M4V, MP4, MKV, 3GP, VP8 and more). However, when we get some H.265/HEVC, MKV in DTS, VOB, AVI(DivX/XviD), TiVo, FLV, MPG, M2TS, M4V, etc. formats that unsupported by Kindle Fire HD/Fire HDX, it would be a bit hard to view them. In that case, to play these videos on Kindle Fire, we need to convert them to MP4 format first. Along with a professional video converter, you can achieve your goal smoothly. Among various video converting tools, Wondershare Video Converter Ultimate is rated in the first place. It is easy to use and helps you fast convert a pile of H.265/HEVC, MOV, MPG, VOB, MKV, AVI, Tivo, etc. videos to a Kindle Fire playable format MP4 with perfect audio and video sync keeping HD quality. Apart from that, it also provides a large variety of output formats that compatible with Nexus 9, Surface Hub, Galaxy S6, Galaxy Tab S, iPad Air, iPhone 6, PS3, PS4, Xbox 360/One and more. Now download a free trial here and follow the step-by-step guide to get HD Videos onto any portable devices to play nicely. Tips: For Mac users, Video Converter Ultimate for Mac is the choice (Here is a free trial version). ← How to move Disney DVD Movies to your Kids Tablet for watching? It really provides fast ripping speed and also high original quality. 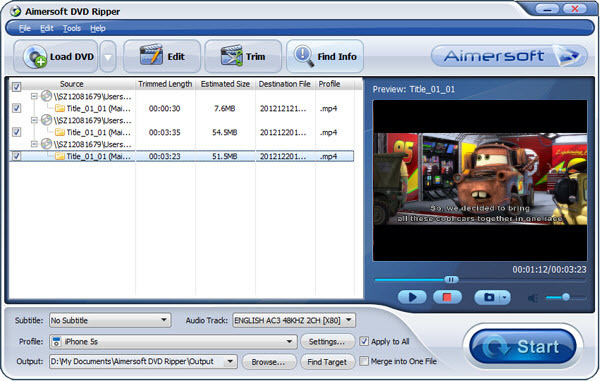 I can use my Aimersoft DVD Ripping software to keep a copy of my movies or music in another device. Break the encryption of any copyright protected disc and get the freedom to use my music or video anywhere I want. It is one of the most stable as well as powerful software available in the market for removing all the protections which is already known to the users. Even though my DVD is copy protected by region code, CSS, Aimersoft DVD Ripper can quickly read DVD information and finish DVD ripping as I like. Ignore reading error helps to restore corrupted files at greatest degree. I have several foreign discs, but my DVD player does not play them. However, when I try Aimersoft DVD Ripper to convert them on to my computer as MP4 files, they play OK with my Kindle Fire HD and other media players. Later I reburn them to my discs, they become free region or what I call multi-region code discs. This is amazing that I can play them on my DVD player. Aimersoft is my looking for! This Aimersoft DVD ripper gives me the power to alter the video elements. I can change the DVD to video/audio settings with abandon, including video quality, frame rate, resolution, audio quality, sample rate, etc.Everything is said and done in just a few minutes! This Aimersoft DVD ripper gives me the power to alter the video elements. I can change the DVD to video/audio settings with abandon, including video quality, frame rate, resolution, audio quality, sample rate, etc. Everything is said and done in just a few minutes! Higher value than I had expected! Thanks Aimersoft! Great DVD Ripping software on Windows PC! I can select single title/chapter to convert or merge several titles/chapters into one output with this software. There are so many output formats listed, such as Kindle Fire, iPhone, iPad, PSP, Xbox. This is an program which I can not only bypass the disc protection from DVD, but also converts them to playable formats for my Amazon Kindle! Geart!